Seriously. Between managing your personal life, supporting yourself financially, maintaining your relationships with family and friends, and generally figuring out who you are, you’ve got a full-time school schedule thrown at you. Needless to say, the balance in juggling these responsibilities can be difficult. For most people, finding a balance may be a challenge at first, but after a while, they hit their stride and maintain a 3.0 or higher. For others, the stresses of college life can be more challenging, taking a significantly larger toll on your overall GPA. When those times of adversity arise, a few tips and tricks to boost your GPA become the highest necessity. And raising your GPA—especially the further you are in your academic career—can be a tall order. 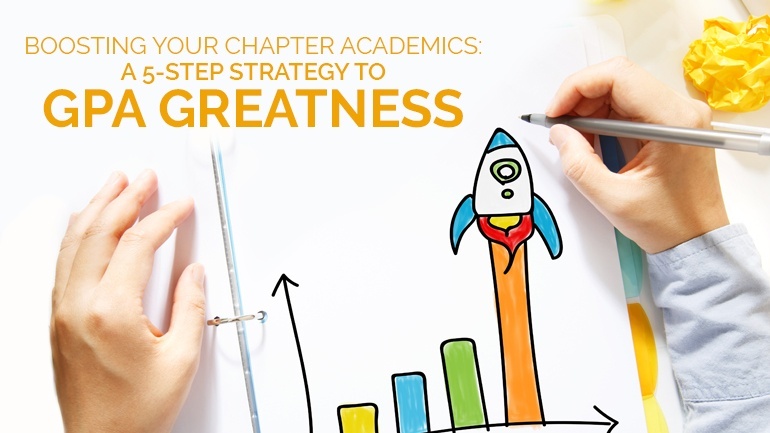 Lucky for you, we here at OmegaFi have braved the darkness in your place and have returned with wisdom through experience, and from it, have mastered the game plan of Boosting Your Chapter Academics: A 5-Step Strategy to GPA Greatness. We’re going to keep it nice and real here: If you’re looking to raise your GPA and have some free-elective requirements floating around, do yourself a favor and pick up the easiest online classes you can find. This means those Intro to Wine and Intro to Food classes--remember, the ones you figured were a waste of time and money? Add those babies to your next semester right now. Because although your university realizes that the class offers little academic merit to students outside of its associated major (more than likely hospitality), sometimes students just need a simple class with no frills. Do your due diligence and be sure to research the classes your university offers, their professors, and their accessibility and workload through websites like Rate My Professor. Trust us, this will save you muchos headaches in the future. Just use these easy-street classes SPARINGLY. And for the love of God, take them seriously. The last thing you want is to score a B- in a slam-dunk class. This option to boost your GPA works off a similar premise to our last entry: The classes at community college are on average easier than those offered by a university. This means that for students who are particularly wise, they’ll choose to pick up their most difficult classes (we’re talking about you, financial accounting and organic chemistry) at the community college right down the street, rather than trying to find the best teacher at their university and risk picking up their first B-. The added benefit to this approach is the cost. In most cases the courses offered by community colleges are about 2/3s the cost of the same class at a university. And when both classes (one at university and one at community college) account for the same number of credit hours, choosing which class to pursue on strictly a financial basis is a no brainer. If you’ve got a scholarship, you’ll need to maintain a schedule of at least 12 credit hours in most cases, which means 4 classes generally. We advise picking up a 5th if you can handle it over at the community college and getting your harder classes within your major’s first two years out of the way there. We’ve said this before and it bears repeating: make nice with your professors. Believe us when we say that forging a good relationship with the people who most directly affect your grade is a good idea. And it doesn’t take much. Talk to them after class (if you’ve got the time) about any lingering questions or concepts after the lecture. This will give you an appropriate amount of face time and your professor will learn to know you by name. As a student, we’re sure you’ve seen time and again how close your final grade can be on that edge of either dipping a grade down or coming up. The difference between that can be as simple as whether or not your teacher likes you, so make those relationships count. Bonus, when you finally graduate and need an academic letter of reference for this or that, you’ll actually have a relationship with your professor to stand on. Okay, so moving away from the more, let’s say cunning tactics, it’s time to get more white-hat. As we stated above, being a student is hard, which means that any and all help should be championed and appreciated. Here’s a simple tip: On the first day of class, sit in the front. Trust us, the people that are most serious about the class aren’t going to be the ones sitting in the back after coming in late and spending the whole class surfing the internet and texting. The people sitting in the front are there because--and this is important--they want to hear what the professor is saying. This is where you want to be seated if you want to be successful. Simply put, this is the easiest and hardest concept on this list by far. It’s easy in the sense that the process is simple. The syllabus and the teacher are telling you exactly what you need to do in order to succeed in the class and get an A. The hard part is that your success relies entirely on your aptitude for self-discipline. With that said, let’s role with the latter process. Go to every single class. Seriously, don’t skip a single one. It doesn’t matter how early it is. You’re not feeling well. You get 3 excused absences. It doesn’t matter. Just go. Read the book. This means you’re not reading the PowerPoint slides alone. That’s just a summary. You need to actually read the source material that the slides are based on. Doing this and actually doing the practice problems in the book will give you a much stronger foundation of the material. Do the work. Don’t skip a homework assignment. Don’t forget it. Do the study guide for the exam. Take the practice exam (we know it’s like 100 problems and the exam is only 20, but do it anyways). Ask for Extra Credit. This suggestion ties back into our point about being close with your professor. This is where that relationship proves its worth. Although extra credit will never be substantial enough to raise your grade ten percentage points, it can be enough to shift the scale in your favor. If it’s there, pick it up like free money. If it’s not, find it. Whether you’re just beginning your college career or are slogging through the last few semesters of it, let us know any tips and tricks to boosting your GPA that you’ve used or seen in the comments below.